Despite some low ratings, the Good Girls TV show has been renewed for a third season at NBC. A half dozen episodes of the second season have aired on Sunday nights and they’ve averaged a 0.62 rating in the 18-49 demographic and 2.41 million viewers (in the live+same day ratings). Compared to the first season, that’s down by 40% in the demo and down by 46% in viewership. A dark NBC comedy drama, Good Girls stars Christina Hendricks, Retta, Mae Whitman, Matthew Lillard, Reno Wilson, Manny Montana, Lidya Jewett, and Izzy Stannard. The TV series centers on three suburban mothers who have been struggling to get by. After a series of setbacks, they hold up the local Fine & Frugal supermarket, but their take far exceeds their expectations. Soon, they’re in deep with the local crime boss, and these “good girls” find themselves with an array of bad choices. In season two, the women have to deal with the fallout of their criminality. NBC has renewed its drama series “Good Girls” for a third season. So far this season “Good Girls” has averaged a 1.1 rating in adults 18-49 and 4.1 million viewers overall in “live plus seven day” ratings from Nielsen Media Research. The most recent telecast on April 7 delivered a four-week high in total viewers, according to “live plus same day” Nielsens, and equaled the show’s top 18-49 rating since its March 3 season premiere. 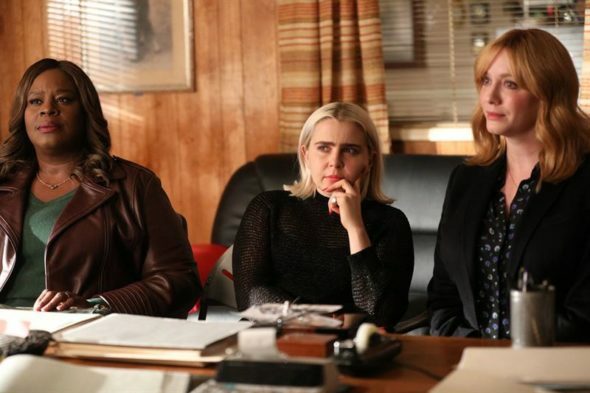 On the digital front “Good Girls” has broken its series record for best seven-day non-linear viewership with each new episode so far this season, allowing the show to double its digital delivery this season versus last. Jenna Bans writes and executive produces. Michael Weaver directs and executive produces. Jeannine Renshaw, Mark Wilding and Bill Krebs also executive produce. “Good Girls” is produced by Universal Television. What do you think? Have you been watching the Good Girls TV show on NBC? Are you glad that it’s been renewed for a third season? More about: Good Girls, Good Girls: canceled or renewed?, Good Girls: ratings, NBC TV shows: canceled or renewed? Good Girls: Is the NBC TV Show Cancelled or Renewed for Season Two? Good Girls: Season Two? Should the NBC Series Be Cancelled or Renewed? I love this show! The cast and the writing are superb and I for one am thrilled to hear there is a Season 3. Good Girls is the main reason I have Hulu. I watched the first season twice already and plan to do the same once season to is over. I love love love this show! I think the casting is incredible and believable! It has become my weekly guilty pleasure. I’m so happy that it has been renewed for a third season and can’t wait to see what happens to my girls! I love the show. Glad it is renewed! So happy for renewal. This is my favorite show that is on right now. I read that the ratings were a little low, but i think that is because of the March premier time slot. Season 3 should start in September, just like other shows, and run a full fall season. Yay!!! I’m so happy that the show is being renewed! I hate it when one episode ends and I have to wait a whole week before I get to find out what happens! It’s very addictive! Love the show, the intrigue & plot twists. I’m 66 & find it fresh & although drama is interwoven with the plot, I also appreciate the tongue-in-cheek humor! Great dark comedy. Writing is always coming up with new twists and turns.